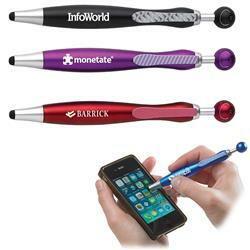 The Swanky custom stylus pen with your logo. 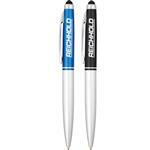 A great 2 in 1 pen that will sure to keep you smiling. It combines a stylus to use with your electronic devices with a ballpoint pen just in case you need to write something down. 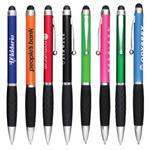 It features silicone rubber stylus for use with any touchscreen device and a click-action ballpoint pen with a smiling cap and coordinated clip. A great promotional item giveaway!